In our world food and wealth are poorly distributed so we made a research on the most famous classic songs about world hunger and poverty. This is our work for the Expo 2015 project. 1) Band Aid was a charity supergroup featuring mainly American, British, and Irish musicians and recording artists. It was founded in 1984 by Bob Geldof and Midge Ure to raise money for anti-poverty efforts in Ethiopia by releasing the song "Do They Know It's Christmas?" for the Christmas market that year. USA for Africa (United Support of Artists for Africa) was the name under which 44 predominantly U.S. artists, led byMichael Jackson and Lionel Richie, recorded the hit single "We Are the World" in 1985. The song was a U.S. and UK number one for the collective in April of that year. This super group was inspired by Bob Geldof's Band Aid. 2) "Heal the World" is a song from Michael Jackson's hit album, Dangerous, released in 1991. The video shows poor children living in Africa. 3) "Imagine" is a song written and performed by John Lennon in 1971. He asks us to imagine a world at peace without borders, hunger and wars. Is he a dreamer? Phil Collins, released in 1989. It is about the problem of hunger and homelessness. When someone asks for our help in the street, do we pretend not to hear? 5) Village Ghettoland is a song by Stevie Wonder about poverty and marginalization, released in 1976. My favorite song among these is heal the world because in its simplicity can express topics like happiness to a child in Africa in a very natural and meaningful. This song is about these poor children who have to try to change the world for them and for us even though away from them as we can help Michael Jackson with them believing that weapons may disappear forever. With this song John Lennon invites us to imagine a world where there isn’t heaven or hell but above us only sky. Then he invites people to live day by day the present without thinking about the future. The song is a hymn to sharing and living together in peace because the world is one. I think the words of john Lennon are deep and full of meaning. I think also that nobody has to be afraid of being alone, but he must continue to fight for what he believes, and especially continue to dream because there is sure out there someone else who shares his same dream. I remember this work. It was so difficoult work, but the result was amazing. This work was also funny and exciting! Between the songs of this "top five" I prefer "Heal the World", by Michael Jackson. I like this song because it says that we have to heal the World for the good of ALL the human race. I hope you enjoy this work, bye-bye! creates a better place for you and for me, "the words of the chorus of the song written by Michael Jackson have a specific meaning: if you help to improve the world, the world will be better for you too! I love all songs but i liked in particular "Heal the World". It's a song against war, it’s an invitation to build a better world. "Heal the world" with the video showing children in precarious conditions in their countries, surrounded by tanks and armed soldiers, that offers hope: slowly these children, trying to survive, trying to change the situation through their games, their simple yet profound gestures (like their smiles or girl with flower in hand) and especially their desire to live a different life made of peace and harmony: the gestures strike at the soldiers so that they throw their arms indignantly and decide to join them. The video arouses a great and sincere emotion at the sight of children so spontaneous and joyful that they have become the symbol of peace and hope for a better future. I think “Do they know it’s Christmas “ is meaningful because it is about the fight against the famine, indeed they say “Do they know it’s Christmas time?” For this reason we have to “throw our arms around the world at Christmas time “but I think we must give people the chance to live their lives without suffering everyday. Your article is pretty cool! It seems that you have worked really hard to do it! 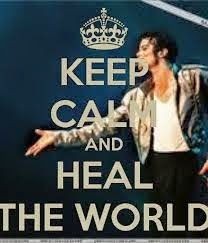 I love "Heal the World" by Micheal Jackson. I hope you will keep doing articles like this one because it's very good!! It's a very good and a beautiful blog. This article is my favourite .Keep on with good work!! Hi ! Your blog is very interesting. I prefer the part with the songs about world hunger and poverty. I like Phil Collins and Michael Jackson, I know John Lennon but I don't know Village Ghettoland and Band Aid but they are fantastic. Your article is very fascinating. Just three words : I love it !!! Hello French friends! You are welcome! We are very happy to hear from you! Let us know some more information about your school and your English lessons! Write us soon!!! Hello, I'm Garance from France. Your posters are a lot of fun and the colors are magnificients. It is a good job. Congratulations !! !